Are you a new freelancer and worried for not being hired. Don’t be depressed. We have a lot of suggestions for you that will help you a most to get hired on upwork soon. There are a number of people interested in freelancing. But they don’t know all the tricks to make money on upwork easily. They just simply open an account and wait for getting hired. But simply opening an account on upwork won’t ensure your getting hired. Let’s go on with all the tricks to get hired on upwork. As a freelancer your first duty is to make your profile 100% complete and make it standard as much as possible. Your profile will represent all the skill and experience you have to your client. A damn profile will damage your career as a freelancer greatly. So, be conscious about developing your profile. Here are some important sides you must take care of while developing your profile. Use a Smiling Picture: It is an important thing for your career what type of picture you are using as a freelancer. Don’t use any sober picture or one that is too much unofficial. Use a professional picture with a smiling and confident face. Your expression really matters to your client. Your picture has more ability to talk to your clients than a thousand of words you use to describe yourself and your skill. So, take care of it while uploading a picture as a profile picture. Ensure that your picture is of high resolution. Take Tests and Show your Result on Top: It is an important thing to take tests and show your result on the top of your profile in order to getting hired. It will strengthen your profile to get a job easily. And there are some clients you know who likes to judge the freelancers simply by their result of tests. So, don’t miss the opportunity to impress your client with your wonderful results on the relevant tests. Make an Impressive Overview: Your overview is the most important thing of your profile. It is the thing that distinguishes you from other freelancers. Your optimistic overview is able to impress your client most. If you write your overview answering why you should be hired then you are right here. Don’t make it too lengthy to seem boring to your client. Make it short and to the point. Try to finish it within 1000 characters. Portfolio: You must set a portfolio as a kind of evidence of your skill and experience. Some clients usually like to check the portfolio of the freelancer before hiring one. If you have any project completed include it here. If you don’t have any work to make a portfolio then work for it. You may make your own website and develop it to make a reference of your website in your portfolio. You know what, Reputation means a lot on upwork. The more you can build up your reputation the more you will get hired. So, you want to know the policy of building up your reputation? There are many ways of it. You will just have to maintain some things such as- Quick Responses to your client, Job Satisfaction, Better Communication with different clients and so on. Usually, Upwork measures your reputation with the Job Success Score you earn throughout your career as a freelancer. The score depends on the satisfaction of your client. The more they are satisfied the more score you earn. 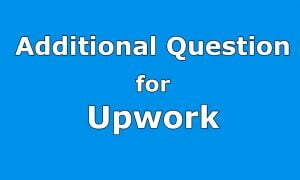 And you can also be benefited in the upwork search engine if you have a high Success Score. Thus you may get a top rated badge. To propose for a job contract you must write a killer cover letter to your client. You must satisfy your client with the surety that you are the one who can assist him with the task. Be concise while writing your cover letter. Highlight your skill and experience. Express your passion for your work. Show your availability. And arrange all these information in a smart and presentable way. Use your well written cover letter as a trap to catch up your clients. As a freelancer it is a must to ensure a niche. You cannot be expert of all trades. So, specify your skill and the area you want to work. You must update your profile according to your niche. You will also have to select a title matched with and relevant to your niche in your profile. It will ensure that your client will take you as an expert of a particular area. So, be selective while choosing a niche and focus on the project only which you can perform well. You must fix a reasonable hourly rate for your work. You cannot rate high. It will make you lose a lot of clients for their budget. You will be un-affordable to them and lose their job. On the other hand too cheap rate also damages your quality. So, make your charge reasonable to get hired more. And thus keep your client happy in both ways with your quality and with his budget. In the world of your freelance there is no scope of interruption or unavailability. If you remain inactive for a long time you will lose many opportunities to get hired. So, don’t do such mistake. Try to remain active as much as possible. You may use your account of skype, email or hangout to ensure your availability always to your client. And search for your work, Knock the clients and you will find you getting hired more and more. There is no scope of misspelling or grammatical mistake in anywhere of you profile or your cover letter. Furthermore Use a standard and smart language everywhere. As a freelancer English Language Proficiency is a must as you are dealing with the clients of different country of different language. So, always take care of your language to make a better impression to your client. Once you get hired, work for it whole heartily not only for money but to earn reputation. Try to give your best to your client so that your client feel tempted to hire you again for his next project. Use all of your skill and experience to do the work in a better way. Submit your work within time to impress your client. Once you submit your work don’t forget to ask for the feedback from your client. Use the feedback for your next project to improve it more. You may also ask your client for 5 star rating and good comments if your client is pleased with your work. Such rating and comment will help you more to convince other clients and to get hired more. These are all of our exclusive tips for you to get hired on Upwork. We hope that it will help you much to make a bright career in the land of freelancing. But all you need is to maintain all these tricks while continuing with your attempts. Only taking advice won’t work if you do not follow them in real. If you really think our site helpful for your project, share it with others. Best of luck! I need to be a successfull on upwork freelancing.